At first their emails offer a welcome diversion, but as Lincoln unwittingly becomes drawn into their lives, the more he reads, the more he finds himself falling for one of them. By the time Lincoln realizes just how head-over-heels he really is, it's way too late to introduce himself. What would he say to her? 'Hi, I'm the guy who reads your e-mails - and also, I think I love you'. After a series of close encounters, Lincoln decides it's time to muster the courage to follow his heart, and find out whether there really is such a thing as love before first-sight. Rainbow Rowell writes books about people who talk a lot. And people who feel like they're screwing up. And people who fall in love. When she's not writing, Rainbow is reading comic books, planning Disney World trips and arguing about things that don't really matter in the big scheme of things. She lives in Nebraska with her husband and two sons. 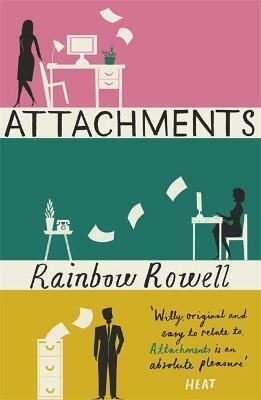 Find out more about Rainbow, and about her other books like ATTACHMENTS and ELEANOR & PARK at www.rainbowrowell.com.